Maasdam Rotterdam, Boulogne-sur-Mer, New York. Boulogne-sur-Mer omitted on return voyages in February. 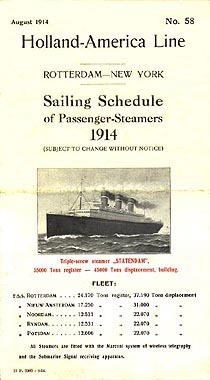 Leerdam Rotterdam, Antwerp (most voyages), Boulogne-sur-Mer, Bilbao, Santander, Gijón (April-July only), La Coruña, Vigo, Havana, Vera Cruz, Tampico. Return voyages: New Orleans, Vera Cruz, Havana, Vigo, La Coruña, Santander (May-August only), Rotterdam. Veendam Rotterdam, Boulogne-sur-Mer, Southampton, Santander, La Coruña, Vigo, Havana, Vera Cruz, Tampico. 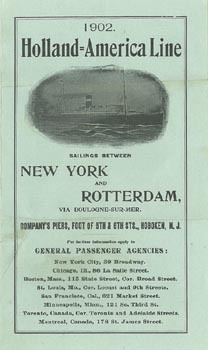 Return voyage: Tampico, Vera Cruz, Havana, New York, Rotterdam. Ryndam Rotterdam, Boulogne-sur-Mer, Southampton, Halifax, New York. 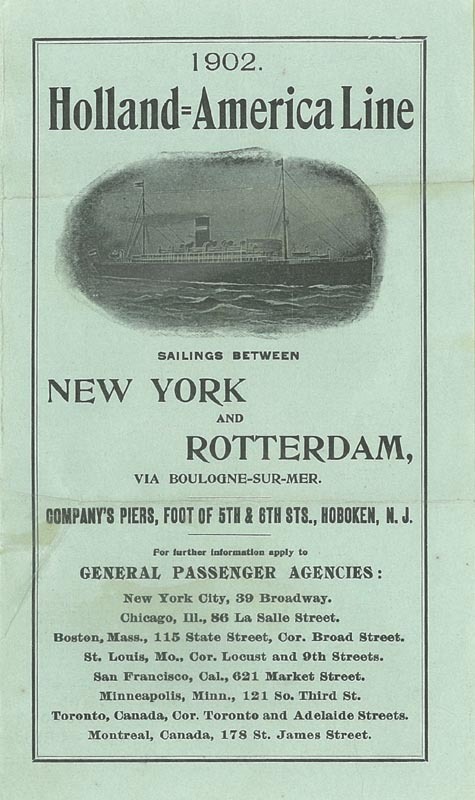 Return voyages: New York, Plymouth, Boulogne-sur-Mer, Rotterdam. Lochmonar Rotterdam, London, Swansea, Curaçao, Puerto Colombia, Cristobal, Guayaquil, Los Angeles, San Francisco, Victoria, Vancouver. Return voyages: Vancouver, Seattle, Tacoma, Portland, San Francisco, Los Angeles, Cristobal, Liverpool, Glasgow, London, Rotterdam. Lochgoil Rotterdam, London, Bermuda, Jamaica, Puerto Colombia, Cristobal, Los Angeles, San Francisco, Victoria, Vancouver. 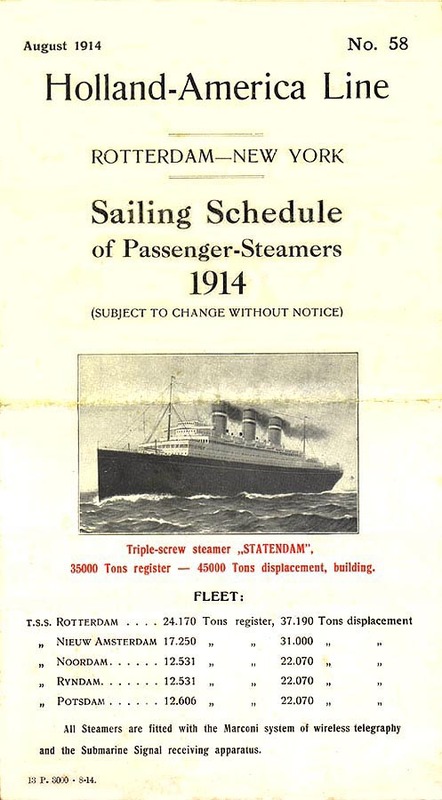 Return voyages: Vancouver, Seattle, Tacoma, Portland, San Francisco, Los Angeles, Cristobal, Liverpool, Glasgow (Dinteldyk on one voyage only), London, Rotterdam. 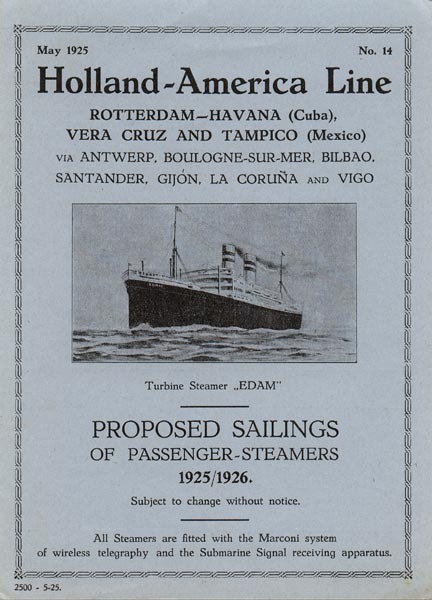 See the archives section for more brochures of Holland-America Line and Red Star Line. See also North German Lloyd. 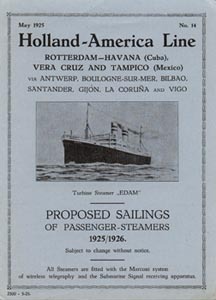 The Unofficial Holland-America Line has a comprehensive history of the line with many photos and other illustrations. This page last updated January 19, 2017.